Alsobrooks Projected to Win Dem Vote Prince George's Co.
Angela Alsobrooks is projected to win the Democratic primary for Prince George's County executive. With 100 percent of precincts reporting, she had won 62 percent of the vote. Alsobrooks is the current State's Attorney for Prince George's County. Donna Edwards came in second, with 24 percent of the vote. Edwards conceded to Alsobrooks in a phone call after a contentious race. 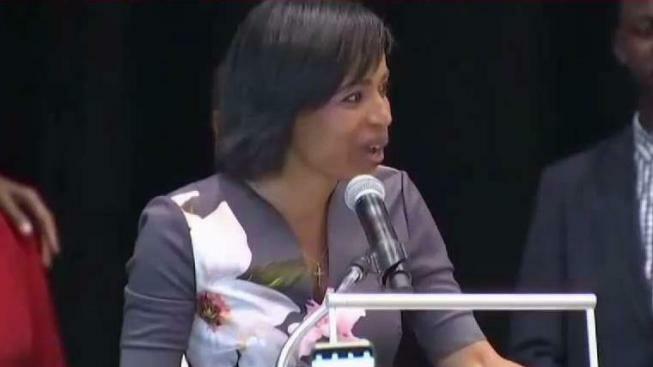 An organization that has raised hundreds of thousands of dollars for Prince George's County executive candidate Donna Edwards is slamming rival Angela Alsobrooks in campaign mailers. The mailers claim Alsobrooks side with developers. The campaign says most of her funds have come from local donations. News4's Tracee Wilkins reports. Nine Democrats and one Republican jockeyed for the position. Alsobrooks, Edwards and Muse were among the front runners. The Post editorial board endorsed Alsobrooks, praising her "record, skills and intellect."